5 signs you might be grinding your teeth! And what you really need to do about it. "I used to grind my teeth, but I don't do it anymore"
"My last dentist ground my teeth down to look like that"
"I don't notice myself grinding my teeth"
I will say that the longer you wait, the more it will cost to fix it. That is pretty much the scenario for delaying most dental work. 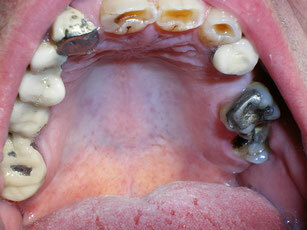 There are actually 3 main reasons people have tooth wear, and not all of them are because of grinding your teeth. This patient came to me because his crown broke. If you look at the photo above and to the left you can see he has a crown that is broken on one of his front teeth and the metal from under his crown is showing in his smile. He has almost no concerns about the rest of his teeth. He said a few times, "I know I have bad teeth.......". When I asked him if he was concerned about the tooth wear, he wasn't sure what I was talking about. The wear is what has destroyed his teeth, not genetics. Look at the shape of his teeth. 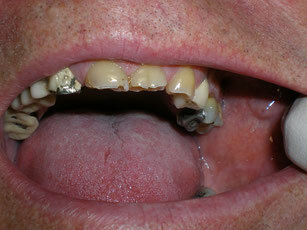 They are short and wide, this is typical of someone that has been grinding their teeth for some time. He has the added bonus of have acidic tooth wear in addition to the physical grinding, that makes things progress at a faster pace. Acidic wear shows up as cupped out areas on the teeth (seen here as the brown areas on his front teeth). This is a case that will cost more money to fix. How much? About the price of a car. What kind of car? That depends........could be a Chevy, could be a Mercedes. We would have to take some more photos and make some models of the teeth to find out. Un-even edges on front teeth. 3. Waking up with headaches or jaw muscle pain. 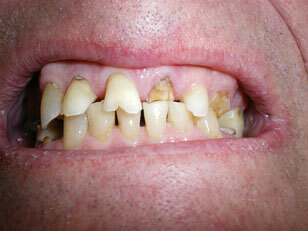 This patient wanted his front teeth fixed, but he didn't want me to shorten them. TRICKY, but we did fix them to his satisfaction. No room to lengthen the teeth. You can see why this is so tricky, there is no space between the teeth when he bites his front teeth together. 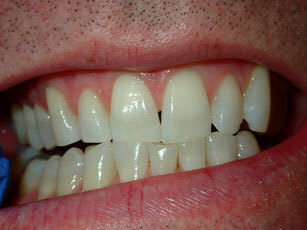 Often times when your teeth wear, they move into each other to close the space between them. So when we try to build them back up they are too tall and the fillings keep popping off. Then everyone gets frustrated. Look at the bottom teeth too. Notice how they are not straight across either. like mountains and valleys. 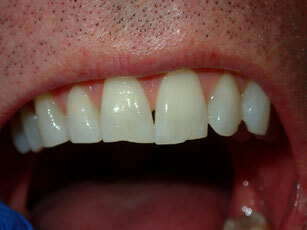 The most aesthetic front teeth are flat on the cutting edges and contact evenly all the way across. Now even after showing this guy the same info I am showing you, he STILL was skeptical about whether or not he was grinding his teeth. Can you see the danger if I fix his teeth and he doesn't believe he is grinding them? Every time they break he will think it is because I did poor dentistry. He destroyed what God gave him, i'm just a lowly dentist. Nothing I put in there can resist his grinding, EXCEPT a night guard. He's not doing this during the day (occasionally people do day-grind their teeth). If we protect the teeth at night, they will hold up a lot longer. So what is the key? The key is to catch it early, and wear a night guard. Yes, you will have to wear it for the rest of your life. Many people think they USED to grind, but they don't now. All the research and literature on the subject says that just doesn't happen. People go thru cycles when they grind more and less, but pretty much once a grinder, always a grinder. A night guard is basically a piece of plastic that you can grind on all night. It won't hurt your teeth, it is just there to take the beating. Some people grind thru their night guard. Can you imaging what they would have done to their teeth!! It's scary!! This poor guy ground his teeth thin, then one day......SNAP!! Notice there is no room for me to put a crown on the tooth. The bottom tooth is right up tight to the top. His teeth moved together as he ground them over the years. I tried to put some white filling material on the front to help the appearance, he was back at my office within a week with that filling broken off. Catch it early and prevent this stuff. Great article and so informative. Boy sounds like the night guard is so important to wear to avoid all that damage to the teeth. I better have you check mine to see if I'm grinding my teeth. Thanks for this great report. I'll be making an appointment soon.